It is that time of year ladies when we become golf widows and our couch has a dent in the cushions. We become golf widows to the Ryder Cup but it could be an opportunity as husbands have limited conversation during this weekend. To say they are slightly distracted would be an understatement. So on Friday introduce that dress that has been hidden in the back of the wardrobe. I have done this already. Saturday tell him you are going to decorate the hall in silver and lilac. This will happen tomorrow. Sunday that's when I might tell him think I might go away with my friend to the sun. Good luck ladies make the most of this opportunity but I have to say my husband is very kind and generous Ryder Cup or not. But I am a golf widow this weekend. The purple hall with the chandelier is gorgeous. 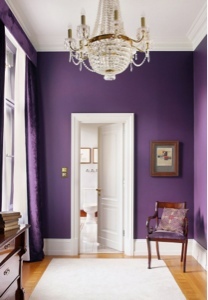 I'm drawn to purple at the moment! Enjoy your weekend. It is what we do!!! Hallo Inge!I agree with you!Have a lovely weekend my dear! Ingride, se você não tivesse postado nada, valia a foto do topo do blog. Maravilha! Muito lindo o mar, o vestido e você! Beijos e abraços!